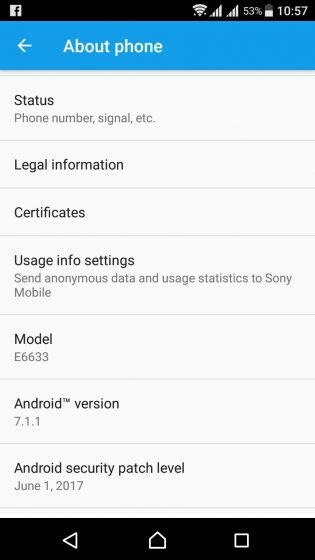 Sony this week is rolling out an Android 7.1.1 Nougat update for several of its slightly older devices: Xperia Z5, Xperia Z5 Premium, Xperia Z5 Compact, Xperia Z4 Tablet, and Xperia Z3+. The update includes Google's June security patch (as you can see in the screenshot on the left), and comes almost five months after these smartphones (and the tablet) received Nougat 7.0 updates - previously, they ran Android 6 Marshmallow. Sony has yet to formally announce this Android 7.1.1 Nougat update, but we're guessing that all owners of the Xperia models mentioned will get the new software version in the near future. Right now, it's not clear if the Sony devices listed here will receive any other major software updates. However, we certainly hope that at least the Xperia Z5 series of smartphones will get Android O at some point. As for the Xperia Z4 Tablet and Xperia Z3+, these are already over 2 years old, so there's a high chance they'll remain on Android 7.1.1. Nougat... forever and ever. I know, right? They have done pretty well on Android OS optimization(maybe? ), provides monthly security updates and Android updates recently. Xperia XZ/X Performance received Nougat updates since November last year, so let's see when will these both devices received Android O updates. it's really nice to see how Sony is updating also their tablet even though is enough old. Wow what a great support! Sony has to be the fastest brand to update theirs phones. Thanks Sony for updating my Sony Xperia Z3+ !! Just asking why Xperia Z-1 is not included in the updating of OS to Nougat or even Marshmallow ? Xperia Z1 was released in 2013 and was released with the S800. Every 2013 S800 phone were all updated only until Android Lollipop. S801 and S805 were updated till Marshmallow, and I think the S810 and S808 would be updated till Nougat only.